Another great piece of art . He looks a bit old in the second picture, but it's a very cool style. What's the meaning of the symbols on the dog-tags? That's his name in Japanese. Neat stuff! I like the profile a lot... Any chance of making these into avatars for free use? Yup, as GeckoZY had mentioned, it's a part of his name in Japanese. But at this time, I was focusing more on the meaning of the character itself, Gi or friendship. Which I think is Fox's main virtue. Coincidentally, there's another husky out there with the name Gi (though a different character). Never really noticed it until recently. Edit: I've given copper the icons personally. Just as a note. Last edited by kurowolfe on Sun Mar 31, 2013 7:57 am, edited 1 time in total. Alright, let's bring some "Swissness" into Housepets. So, please meet Barry, the St.Bernhard dog. ... and yeah, I couldn't resist to let him speak Swiss German. For those people who aren't too familiar with that "easy" language (like peanut), there is also the translation box at the bottom right corner. I always wondered, at what age do Saint Bernard dogs start growing the tiny barrel of whisky around their necks? P.S. I'm putting the lolface so that those that not that bright understand I'm kidding. Barry, eh? *takes note in the secret dossier library I have on everyone* Thanks Cobra! I think, Rick would draw him bigger and with more crinkles. It would be really cool to see a St. Bernard someday in Housepets! I always thought it was rum, or brandy? I mean, from what I remember, both of these warms your body, which might be useful for warming a victim subjectively. Wow Hukley, your drawings are pretty good. Also here's hoping that Rick makes a Saint Bernard character in Housepets. 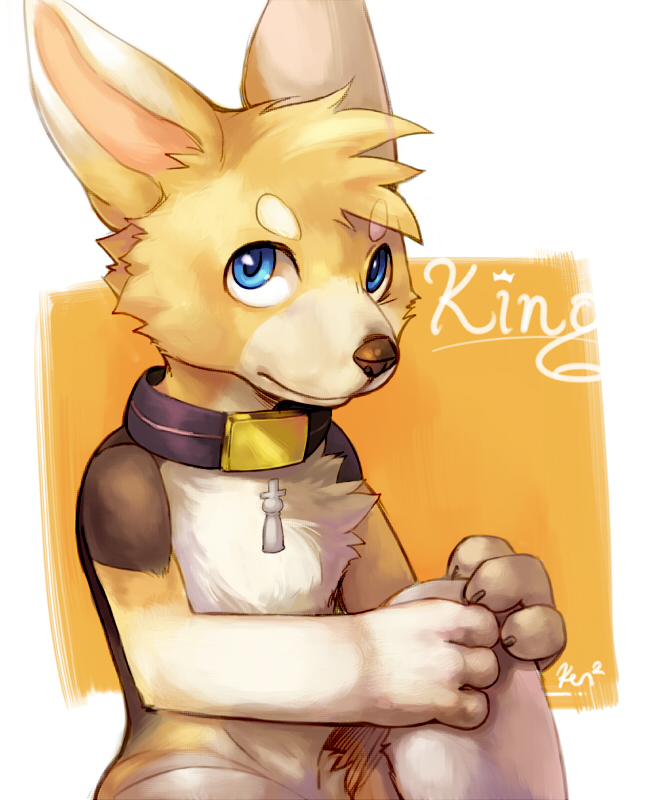 Daw..... That's a really cute picture of King! I love the shading work done on it. It has a very rustic look to it. But the image is broken here. I think it's because you're just linking to the page it's on, not the actual image. I wonder... Is it possible to link together the URL and IMG codes here? That's just awesome... long live (the) king! ... Is that hand drawn? It's very hard to tell since it's so awesome. It is indeed a very well drawn picture. King never looked so young! Whew! I finally finished this one. Last week, I found an old photograph of my schooldays. I thought, it would be a nice idea for a fanart. All the characters you drew. That. was. FANTASTIC! 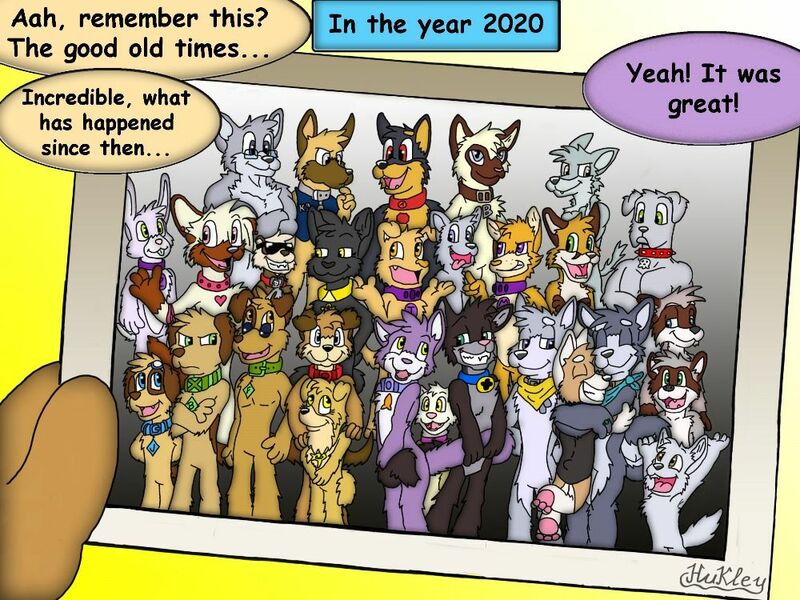 It might even be Rick's last Housepets comic strip, but hopefully it will be a very long way to go. And, Huckley, seriously, you verdid yourself! This is amazing! Nice drawing! A newborn classic indeed. Wow, that's a really good picture Hukley! The only flaws I see on it is that Joey is too short and Fido's collar should be light brown now, but that's okay XD. The only flaws I see on it is that Joey is too short and Fido's collar should be light brown now, but that's okay XD. Hm, i made him the same size as king and a head shorter than Fido.. but in comparison with Bino he really looks a little bit too short. And you're right with Fido's collar. Just didn't realize it. Alright, here is another one. 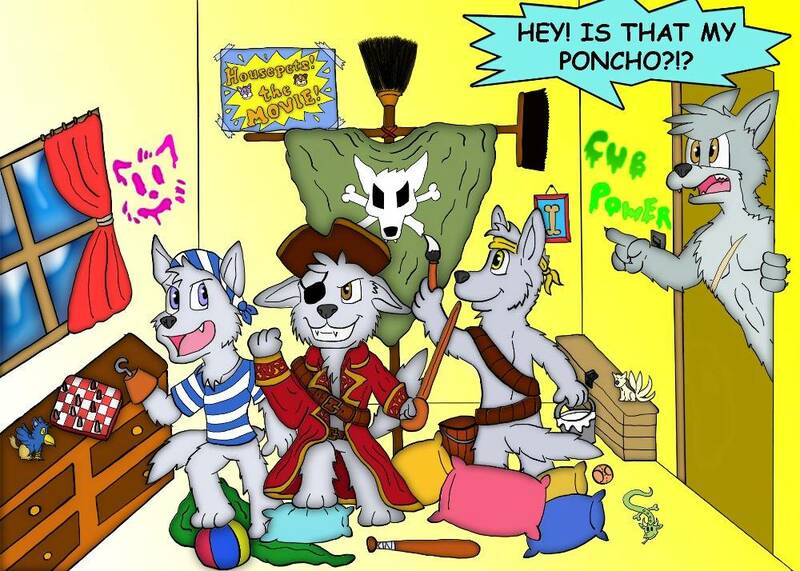 So here is: "Pirates of the Babylon Gardens"
Excellent drawing Hukley, you're improving a lot! Is that supposed to be a cat drawing of the wall? Looks like Grape. Is one of the cubs crushing on Grape? Housepets! : Where everyone is secretely in love with everyone else. this is so fun on so many levels! Hm, nice theory ... well, I actually had an intention with that scribbling... but I think i don't want to spoil it. Last edited by Hukley on Thu Apr 11, 2013 2:46 pm, edited 1 time in total.